A row has broken out after it was revealed that a world-famous cycling race taking place in the city next year has not included West Belfast along the route – the only part of the city to be excluded. The prestigious Giro d’Italia is scheduled for next May and includes a 22km time trial around Belfast, a loop around the north coast and a cross-border final stage. However, ahead of next week’s official launch in Milan, a map of the circuit shows that while the race will include North, South and East Belfast, the West has been omitted. This new row how brought into sharp focus how West Belfast has been treated in relation to major sporting events in recent years. As our map shows, the Belfast City Marathon spends only a fraction of its running time in West Belfast compared to the rest of the city, taking in Divis Street, Clonard Street, briefly on to the Springfield Road before crossing into the Shankill – approximately 1.9 miles out of a distance of 26.2 miles. Last month’s Mini-Marathon avoided West Belfast entirely. Now the eagerly awaited Giro too will miss out the West of the city. Both Sinn Féin and the SDLP have hit out at the decision not to include the district and the area’s MP has called for a meeting with the Department of Enterprise, Trade and Investment on the matter. Paul Maskey, who in 2005 led a campaign with this newspaper to overturn a decision that saw West Belfast excluded from the city’s Marathon route, is urging a revision of the cycling tour’s route. “I would like to congratulate the local organisers of the Giro d’Italia for successfully bringing one of the most famous cycling races to Belfast,” he said. “However those behind the designing of the route have in my opinion made a huge error of judgment by excluding West Belfast. 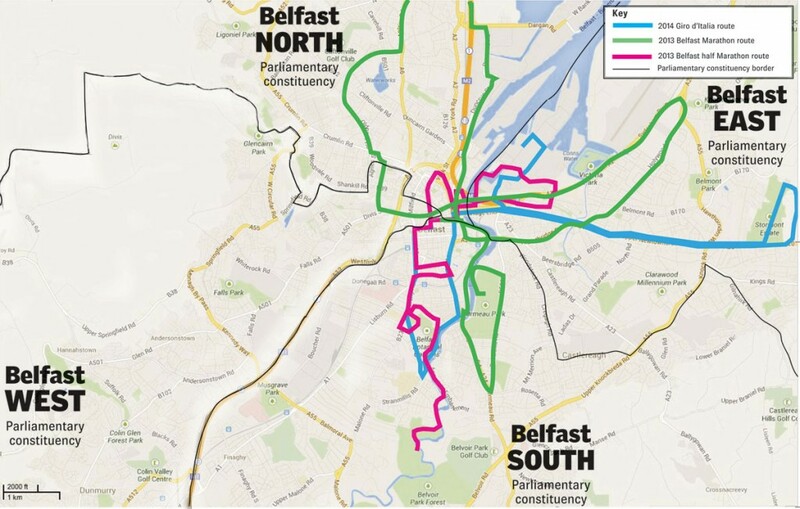 North, South and East Belfast are all represented on the route, so why not the West? The West of the city is a major tourism attraction with, for example, nine out of 10 tourists who take a black taxi tour stating that West Belfast is a major draw for them. It was a poor decision not to include a vibrant part of Belfast. “Given the fact that £400,000 is being invested by Belfast City Council, all parts of the city should be showcased to this huge international market. “The image of cyclists going up and down the Falls and Shankill roads would send out a massive positive signal right across the world. SDLP Councillor Tim Attwood has also questioned the exclusion of the district from the Giro d’Italia route. “I am deeply disappointed that next May’s Giro d’Italia cycle race will not be passing through West Belfast, despite covering the rest of the Belfast area,” he said. “My colleague Councillor Pat McCarthy had helped secure this prestigious race and we are deeply disappointed that participants will not be able to race through every part of Belfast. The Department of Enterprise, Trade and Investment, who played a lead role in attracting the race and whose DUP minister Arlene Foster will fly to Milan next week for the launch, said they had no input in the devising of the route. Darach McQuaid is a Partner at Shadetree Sports, the company which represents the owners of the event, RCS Sport. Darach told the Andersonstown News that it is RCS who establish the route and that it was not “feasible” to include all areas of the city in the circuit. “RCS Sport, the event owners, have the ultimate say in where any stage of the race route goes,” he said. “Shadetree Sports, as the local organiser of the Big Start, North and South, have been consulting with RCS on the potential stage routes since the very beginning of the bid process, which we managed. “Above all else, this is a professional sporting event and sporting considerations have to be paramount during the decision making process. “Road races and time trials – individual and team time trials – require different types of road to fit the discipline. The nature of the road closures which an event of this size has, also comes into play in a critical manner. When you are looking at closing down a sizeable portion of a city, the traffic system needs to be able to breathe and not create major bottlenecks given the significant road closures. Despite the disappointment felt in West Belfast, Darach says “sporting considerations” were paramount.